Nestled amidst the picturesque view of extensive Himalayan snow ranges and panoramic Doon Valley, Mussoorie is a charming hill resort in the state of Uttarakhand- the land of Gods. Whether you are planning a weekend getaway with family, short holiday or honeymoon, this charming hill station won�t disappoint you in any manner to make your holiday memorable. So, plan a tour now. Located 65 km away from the airport and 35 km from railway station, this 2-star property is meant to provide lavish accommodation to the visitors. It also provides banquet and conference facilities. Its well-appointed rooms are categorized into Deluxe Room, Luxury Room, Executive Room and Family Suite. The hotel has a multi-cuisine restaurant serving wide range of delicious food. On your arrival in Mussoorie- the queen of the hills, meet our travel representative and get transferred to the hotel. Check-in to your room and relax. Spend the evening at leisure. Enjoy overnight stay at hotel. Enjoy sumptuous breakfast at the hotel and leave for the local sightseeing tour of Mussoorie. 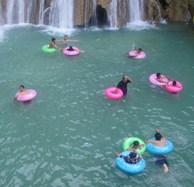 With this tour, you will get to visit various tourist attractions of Mussoorie such as Kempty falls, the Gun Hill etc. Also, enjoy shopping at the Mall Road. Later, return to the hotel and relax overnight.